LOCATION.--Lat 40°35'41", long 75°11'23" referenced to North American Datum of 1983, Pohatcong Township, Warren County, NJ, Hydrologic Unit 02040105, on left bank, upstream side of suspension bridge at Riegelsville, 600 ft upstream from Musconetcong River (flow of which is included in the records for this station since Oct. 1, 1931), and at river mile 174.8. PERIOD OF RECORD.--Continuous-record discharge station, water years 1906-71. Annual maximum gage, water years 1972-2007. 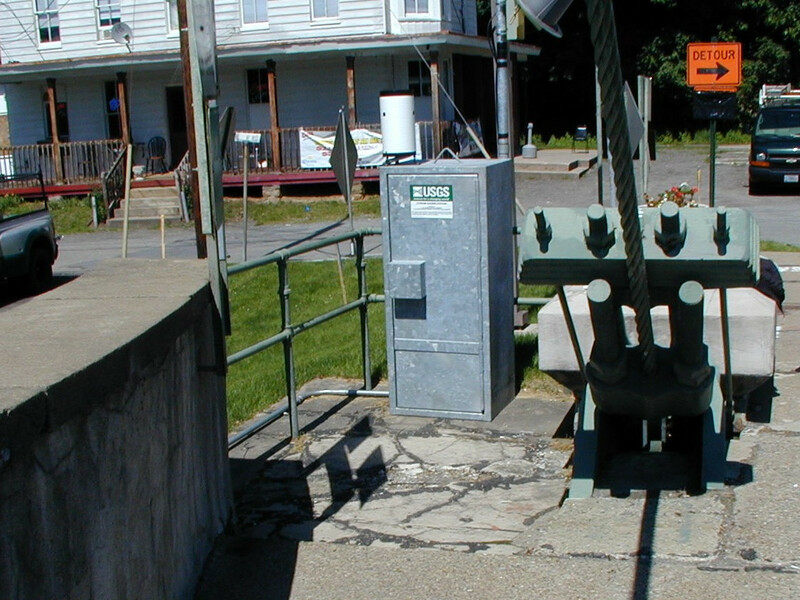 Continuous-record gage-height station with annual maximum discharge, water years 2008 to current. GAGE.--Water-stage recorder with telemetry. Datum of gage is 125.12 ft above NGVD of 1929. REMARKS.--Annual peak data can be obtained by selecting Peak streamflow from the 'Available data for this site' drop-down menu above or by using this link. Discharges above 160,000 ft3/s from rating curve extension on basis of slope-area computation of peak flow. EXTREMES FOR PERIOD OF RECORD.--Maximum discharge, 340,000 ft3/s, from rating curve extended above 160,000 ft3/s on basis of slope-area computation of peak flow, Aug 19, 1955, gage height, 38.85 ft.
PERIOD OF RECORD.--Water years 1934, 1943, 1950, 1960-79, 1991 to June 2009.